Georgia, formally the Georgian Soviet Socialist Republic (Georgian SSR; Georgian: საქართველოს საბჭოთა სოციალისტური რესპუბლიკა, translit. : sakartvelos sabch'ota sotsialist'uri resp'ublik'a; Russian: Грузинская Советская Социалистическая Республика, translit. Gruzinskaya Sovetskaya Sotsialisticheskaya Respublika), was one of the republics of the Soviet Union from its inception in 1922 to its breakup in 1991. Coterminous with the present-day republic of Georgia, it was based on the traditional territory of Georgia, which had existed as a series of independent states in the Caucasus prior to annexation by the Russian Empire in 1801. Independent again as the Democratic Republic of Georgia in 1918, it was annexed by Soviet forces, who invaded it in 1921. 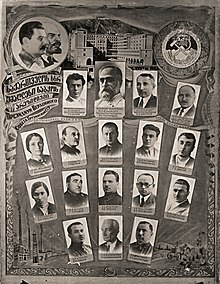 The Georgian SSR was subsequently formed, though from 1922 until 1936 it was a part of the Transcaucasian Socialist Federative Soviet Republic, which existed as a union republic within the USSR. From November 18, 1989, the Georgian SSR declared its sovereignty over Soviet laws. The republic was renamed the Republic of Georgia on November 14, 1990, and subsequently became independent before the dissolution of the Soviet Union on April 9, 1991, whereupon each former SSR became a sovereign state. Location of Georgia (red) within the Soviet Union. In the South Ossetian AO. Order of the Red Banner of Georgian SSR, 1923. Geographically, the Georgian SSR was bordered by Turkey to the south-west and the Black Sea to the west. Within the Soviet Union it bordered the Russian SFSR to the north, the Armenian SSR to the south and the Azerbaijan SSR to the south-east. On November 28, 1917, after the October Revolution in Russia, there was a Transcaucasian Commissariat established in Tiflis. 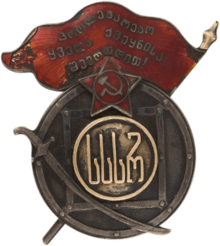 A moderate, multi-party democratic system led by the Social Democratic Party of Georgia (Georgian Mensheviks) operated in the Democratic Republic of Georgia, which existed from May 1918 to early 1921. But in February 1921, the Red Army invaded Georgia. The Socialist Soviet Republic of Georgia was established on February 25, 1921. On March 2 of the following year the first constitution of Soviet Georgia was accepted. The first Supreme Soviet of the Georgian SSR members. From March 12, 1922, to December 5, 1936, it was part of the Transcaucasian SFSR together with the Armenian SSR and the Azerbaijan SSR. In 1936, the TSFSR was dissolved. During this period the province was led by Lavrentiy Beria, the first secretary of the Georgian Central Committee of the Communist Party of Georgia. The Soviet Government forced Georgia to cede several areas to Turkey (the province of Tao-Klarjeti and part of Batumi province), Azerbaijan (the province of Hereti/Saingilo), Armenia (Lori province) and Russia (northeastern corner of Khevi, eastern Georgia). In 1936, the TSFSR was dissolved and Georgia became the Georgian Soviet Socialist Republic. Lavrentiy Beria became head of the Georgian branch of the Joint State Political Directorate (OGPU) and was transferred to Moscow in 1938. Reaching the Caucasus oilfields was one of the main objectives of Adolf Hitler's invasion of the USSR in June 1941, but the armies of the Axis powers never reached as far as Georgia. The country contributed almost 700,000 fighters (350,000 were killed) to the Red Army, and was a vital source of textiles and munitions. 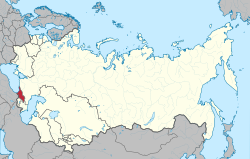 During this period Joseph Stalin (an ethnic Georgian) ordered the deportation of the Chechen, Ingush, Karachay and the Balkarian peoples from the Northern Caucasus; they were transported to Siberia and Central Asia for alleged collaboration with the Nazis. He abolished their respective autonomous republics. The Georgian SSR was briefly granted some of their territory until 1957. On March 9, 1956, about a hundred Georgian students were killed when they demonstrated against Nikita Khrushchev's policy of de-Stalinization that was accompanied by an offhanded remark he made about Georgians at the end of his anti-Stalin speech. Shevardnadze's appointment as Soviet Foreign Minister in 1985 brought his replacement in Georgia by Jumber Patiashvili, a conservative and generally ineffective Communist who coped poorly with the challenges of perestroika. Towards the end of the late 1980s, increasingly violent clashes occurred between the Communist authorities, the resurgent Georgian nationalist movement and nationalist movements in Georgia's minority-populated regions (notably South Ossetia). On April 9, 1989, Soviet troops were used to break up a peaceful demonstration at the government building in Tbilisi. Twenty Georgians were killed and hundreds wounded and poisoned. The event radicalised Georgian politics, prompting many – even some Georgian communists – to conclude that independence was preferable to continued Soviet unity and would provide Georgia with a chance to fully integrate both South Ossetia and Abkhazia, whose peoples were still loyal to the Union. On October 28, 1990, democratic parliamentary elections were held, and on November 15 the nation was renamed the Republic of Georgia. Georgia (excluding Abkhazia) was one of the six republics along with Armenia, Moldova and the Baltic States who boycotted participation in the March 1991 union-wide preservation referendum. It declared independence on April 9, 1991, under Zviad Gamsakhurdia, as one of the republics to secede just four months before the failed coup against Gorbachev in August, which was supported by a declining number of hardliners. However, this was unrecognized by the Soviet government and Georgia was in the Soviet Union until its collapse in December 1991. ^ The Europa World Year Book 2004, Volume I. Europa World Year Book (45th ed.). London: Europa Publications. 2004 . p. 1806. ISBN 1-85743-254-1. However, Georgia was invaded by Bolshevik troops in early 1921, and a Georgian Soviet Socialist Republic (SSR) was proclaimed on 25 February. ^ . Geronti Kikodze (1954) Notes of a Contemporary, first published in 1989, Mnatobi, Issue 1, Tbilisi, Georgia. ^ Parrish, Michael (1996). The Lesser Terror: Soviet State Security, 1939-1953. Greenwood Publishing Group. p. 102. ISBN 0-275-95113-8. ^ Gregory Grossman, ‘The "Second Economy" of the USSR’, Problems of Communism, vol. 26 no. 5, 1977, quoted from Cornell, Svante E., Autonomy and Conflict: Ethnoterritoriality and Separatism in the South Caucasus – Case in Georgia Archived June 30, 2007, at the Wayback Machine. Department of Peace and Conflict Research, Report No. 61. p. 149. University of Uppsala, ISBN 91-506-1600-5.